Judicial authority is constituted by everyday practices of individual judicial officers, balancing the obligations of formal law and procedure with the distinctive interactional demands of lower courts. Performing Judicial Authority in the Lower Courts draws on extensive original, independent empirical data to identify different ways judicial officers approach and experience their work. It theorizes the meanings of these variations for the legitimate performance of judicial authority. 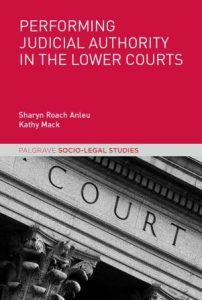 The central theoretical and empirical finding presented in this book is the incomplete fit between conventional norms of judicial performance, emphasizing detachment and impersonality, and the practical, day-to-day judicial work in high volume, time-pressured lower courts. Understanding the judicial officer as the crucial link between formal abstract law, the legal institution of the court and the practical tasks of the courtroom, generates a more complete theory of judicial legitimacy which includes the manner in which judicial officers present themselves and communicate their decisions in court.